As the many parks and attractions at the hotly-anticipated Dubai Parks and Resorts start to open their doors to an excited public, it’s hard to know just where to start when it comes to discovering Dubai’s theme park wonderland, particularly if you are a first-time visitor to the city. With a legion of Hollywood- and Bollywood-inspired attractions set to join Dubai’s already formidable line-up of gravity-defying, adrenalin-pumping, dare-devil rides, you need an insider’s knowledge on how to get the best out of this bewildering array of fun grounds. This guide will guarantee visitors save time and money while having the time of their lives. Top tip: If your birthday falls during the week you are planning to visit the park, register online to receive a free Aquaventure Waterpark day pass. Also, purchase your ticket in advance (at least 24 hours prior to arrival) online and save up to AED60 or buy a combo ticket like the Discovery Package for AED 310, which includes a meal deal and a visit to rare Albino Alligators at The Lost Chambers Aquarium. Getting there: Aquaventure can be accessed via Atlantis The Palm on The Palm, Jumeirah and visitors can easily travel there by Dubai Taxi. If you choose to drive, park in the Aquaventure Car Park on the west side of the hotel and then take the free shuttle bus. Best time: Just before the park opens at 10am – purchase tickets, lockers and towels, secure the best sunbeds in the park and go on the most thrilling rides a couple of times before the throng arrives. Keep aside a day to enjoy the park at a leisurely pace. Best rides: Shark Attack, which features a Shark-filled tank; Poseidon’s revenge, officially the most terrifying waterslide in the Middle East and Leap of Faith – a nine-storey drop in three seconds. Best route: In a tube on the River Rapids, which travels around the entire waterpark and operates a bit like a hop on-hop off tour bus. It factors in stops at key attractions, restaurants and other relaxation zones. There is also a free buggy service shuttling between rides, attractions and restaurants. Best place to camp: In one of the private cabanas, which comes with sunbeds, hammocks, unlimited water, fruit basket and a personal cabana assistant. Best gear: Your best swimsuit and flip-flops; the concrete gets hot during the day so footwear is a must. Aqua shoes are a great choice too. Family tip: Eat a good breakfast and carry plenty of sunscreen. Also, pick a central location as a meeting point should you get separated. Top tip: Book a two- to three-day stay at the Lapita™ Hotel, a Polynesian-themed family hotel, which is part of the Marriott Autograph Collection. Located within walking distance of all three theme parks, it helps families have a stress-free and fun break without going through the anxiety of getting to and from a city hotel every day. Getting there: Dubai Parks and Resorts is located opposite Palm Jebel Ali and can be easily accessed from Dubai and Abu Dhabi via Sheikh Zayed Road. There is plenty of parking on site and a shuttle service is planned. Best time: Weekdays (Sun – Thurs) in the morning to beat the crowds and enjoy the best rides. Reserve at least one day for each park as motiongate™ Dubai, Bollywood Parks™ Dubai, LEGOLAND® Dubai and LEGOLAND® Water Park are quite distinct from one other and collectively feature more than 100 rides. Best rides: Shrek’s Swamp at motiongate™ Dubai; the Broadway-style Bollywood musical to be staged in the 850-seat Rajmahal Theatre in Bollywood Parks™ Dubai and Conquer the Dragon and the rollercoaster ride through a King’s medieval castle in LEGOLAND® Dubai. Best route: If time is of the essence, identify your best rides in advance and build your itinerary around this. 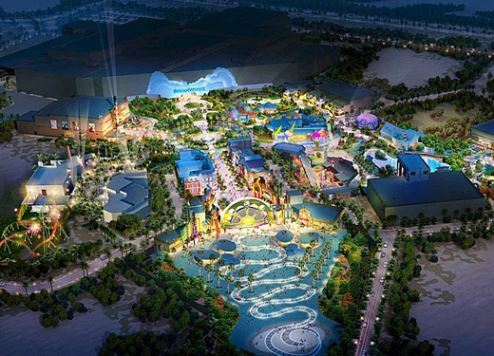 The three theme parks are located within walking distance of each other and there are cooling zones and shaded walkways throughout to ensure it is comfortable for guests to move around. Best place to camp: The three parks are connected by Riverland™ Dubai, a uniquely themed retail and dining destination at the heart of Dubai Parks and Resorts that offers a great base to relax in and reenergise. Best gear: Long, loose fitting clothes and comfortable shoes. Family tip: Take regular breaks from the fun to refuel and recharge as there is a lot to take in. What’s open now? LEGOLAND® Dubai and Riverland™ Dubai opened on October 31. Bollywood Parks™ Dubai, LEGOLAND® Water Park and the Lapita™ Hotel will open on November 15 followed by MOTIONGATE™ Dubai on December 16. Top tip: Check with your travel agent if there any special deals running on holiday offers. Getting there: The park is located on Sheikh Mohammed bin Zayed Road, making it really accessible by taxi. It is a 20-minute drive from most of the city’s hotels. Best time: It is best to get to the park as early as possible to beat the crowds. The park is open from 10am to 12midnight. Set aside a day for the entire experience. Each zone in the park is themed as a different world, with retail and F&B outlets an extension of the rides. For example, the Marvel Zone has an NYC theme and includes a Downtown Shawarma spot. Best rides: The Velociraptor, a thrilling 1.1 km rollercoaster that propels guests to speeds of up to 100 km/hr in 2.5 seconds that spans the deep, dark pre-historic jungles of the Lost Valley out into the Dubai desert and back; The Haunted Hotel, which is overrun by ghouls and axe-yielding madmen; and the Hulk Epsilon 3D, the first of its kind ride featuring Hulk as he battles his arch nemesis, The Leader. Best route: Download the exclusive IMG Worlds of Adventure mobile app, which has a built-in GPS system so you can easily navigate the park. It will also give you the latest information about the 20+ rides and attractions. Best place to camp: There are 28 different F&B outlets, so there are a lot of options from which to choose if you want to catch your breath or grab a coffee. Best gear: Comfortable clothes and closed-toed shoes as you will running from ghouls a fair bit. Family tip: Visit the IMG Worlds website in advance to get familiar with IMG Worlds of Adventure to plan the day. Also, purchase the VIP or Ultimate Fast Track experience tickets as they grant priority and you don’t have to wait in queue with impatient children (or adults). Top tip: Make the most of the admission packages, which include vouchers for F&B for reasonable prices. Getting there: The waterpark is located in the heart of Dubai, only 20 minutes away from DXB International Airport and is easy to get to via taxi. Best time: Get there as early as possible to beat the crowds. The waterpark opens at 10am. Best rides: Jumeirah Sceriah, Burj Surj and Tantrum Alley – however, beware, none of these rides are for the faint-hearted! Best route: While the waterpark does offer every guest a complimentary map, with 13 interconnected rides, it is easy to seamlessly explore the park. Best place to camp: In the wave pool – there are also VIP cabanas with private seating and butler services. Family tip: Wild Wadi is the perfect family destination, with trained and skilled lifeguards monitoring every ride. For adults, the Master Blaster, Jumeirah Sceriah and Tantrum Alley will get the heart pumping and for children, Juha’s Dhow and Lagoon and the Lazy River will keep them entertained for hours.